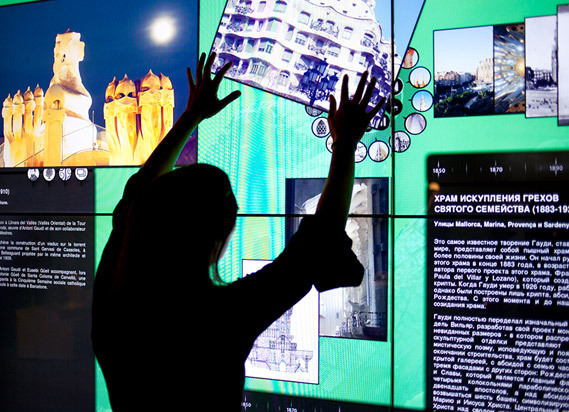 Here you have all the information you need to visit G Experiència and delve into the genius of Modernist Architecture with 4D and interactive technology. You’ll see Gaudí through new eyes! Metro The nearest stations are Lesseps (recommended) and Vallcarca (L3). Bus 24, 31, d40, H6, 92, neighbourhood bus 116. Tourist bus blue line Park Güell stop. Prohibited for children under 4 years. Come discover Gaudí in a whole new way! 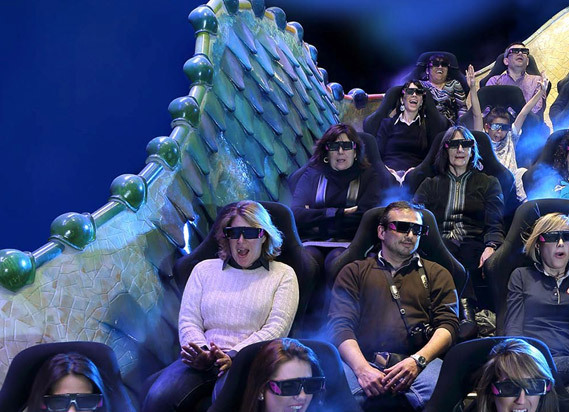 G Experiència offers a visit that is both cultural and fun, in which teachers and students begin by enjoying a 4D audiovisual on Gaudí’s creative imagination. This experience creates a relaxed setting that promotes learning, facilitating the teaching activity using the large interactive wall screens that cover the life and work of this genius of Modernisme. The Gaudí’s Universe teaching activity is led by G Experiència staff, who adapt the contents to the students’ knowledge and have them work on skills suitable to their age and school level. Plus, Gaudí’s Universe can be complemented with a visit to Park Güell. We expand the activity, focusing on the Park and accompanying the group on a visit through its paths while explaining the history of this innovative project and how it ended up becoming public space belonging to the city of Barcelona. Visit G Experiència as a group and save on tickets. We offer special rates for groups of more than 10 pepole. Plus, we offer joint tickets for G Experiència + Park Güell (must be booked ahead) and even organise customised guided tours. Don’t hesitate to ask us! *by reservation only, please contact us for enquires and booking. Come and discover Gaudí in a different way! G Experiència offers you the chance to organize private events in an innovative, cutting-edge setting in the city of Barcelona. A suggestive space to hold business meetings, conferences, product presentations or cocktail parties. And just meters from Park Güell! A unique space with carefully crafted staging inspired by the work of Gaudí, and an innovative projection system featuring 4D technology: 3D audiovisuals on a 50 m2 Scope screen, 7.1 surround sound, active stereoscopy, moving seats and air and water effects to draw the spectator in. The projection room can be reserved any time of day for private sessions of the 4D audiovisual on Gaudí with room for groups of up to 70 people per session. In addition to private screenings of the 4D on Gaudí, this space can also be used for meetings, presentations and conferences. The room can also be rented out for your own projections. The private experience can be accompanied by other services like catering and hostesses. Timetable: Private screenings any time. Other uses after 7pm. Included: Option of personal screening of Gaudí Experiència, heating/air-conditioning, security. A 245-m2 space that fits 110 people. Equipped with three sets of large tactile screens, this room allows for a wide variety of uses depending on the type of event you want to hold. Its decoration and layout make it perfect for cocktail parties, dinners and celebrations. It can be rented out and set up according to the needs of the event. The private experience can be accompanied by other services like catering and hostesses. Included: Gaudí Experiència personnel, heating/air-conditioning, security. G Experiència is a new way to get to know Gaudí and his work. For the first time you will be able to enter into the creative universe of Antoni Gaudí thanks to the most innovative audiovisual and interactive technology. Learn and thrill.